A humble soil additive used by millions of amateur and professional gardeners alike is set to slash the cost of the most effective form of insulation for buildings. 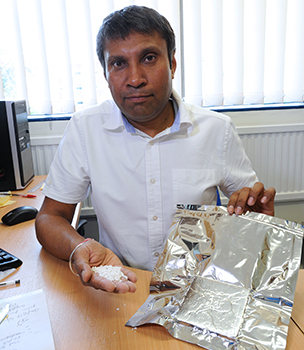 Brunel University London academic Dr Harjit Singh has proved in the laboratory that vacuum insulation panels can be made with a core of perlite - the volcanic ore “popcorn” used in horticulture to improve drainage and water retention. This dramatically reduces the cost of the panels which are normally made by surrounding a core of fumed silica with metallised PET envelope. Initial cost savings are estimated to be at least 30 per cent. Said Dr Singh: “Using perlite also has a number of other advantages. Perlite has a significantly lower embodied energy content than fumed silica. Perlite is manufactured at less than 1000°C whereas making fumed silica requires much higher temperatures, up to 3000°C”. “In terms of performance vacuum panels are five to eight times more effective a form of insulation than rock wool or solid foam panels. When you consider 43% of the UK’s CO2 emissions are from buildings the potential significance of a switch to vacuum insulation panels is obvious. Dr Singh is also investigating novels ways of using his technology. One, in its early stages, is to make small panels and embed them in a flexible framework to make insulating “wallpaper”. He explained: “One of the drawbacks of vacuum panels is that any minutest damage can lead to a complete loss of vacuum, which means loss of insulation advantage. “Our concept is to embed the panels in a mesh which can then be covered in a thin coat of plaster as builders currently do with plasterboard. Also, by using far more but much smaller panels, if any are damaged the insulation will still perform well. “Such a system would also lend itself to property owners being able to take a piecemeal approach; insulating a house room by room rather than in one go.